The TRAIL widget is a search box that can be added to your LibGuides or webpages allowing users to search the TRAIL archive easily. It brings the search interface to your users! Librarians using Springshare’s LibGuides software are familiar with the availability of many search widgets and the customization features available. Example of the TRAIL Widget used in a Technical Report LibGuide at Iowa State University. The TRAIL Widget Code can be found on the right side of the TRAIL LibGuide. If you need technical assistance regarding this widget, contact Norma Dowell at njdowell@iastate.edu. 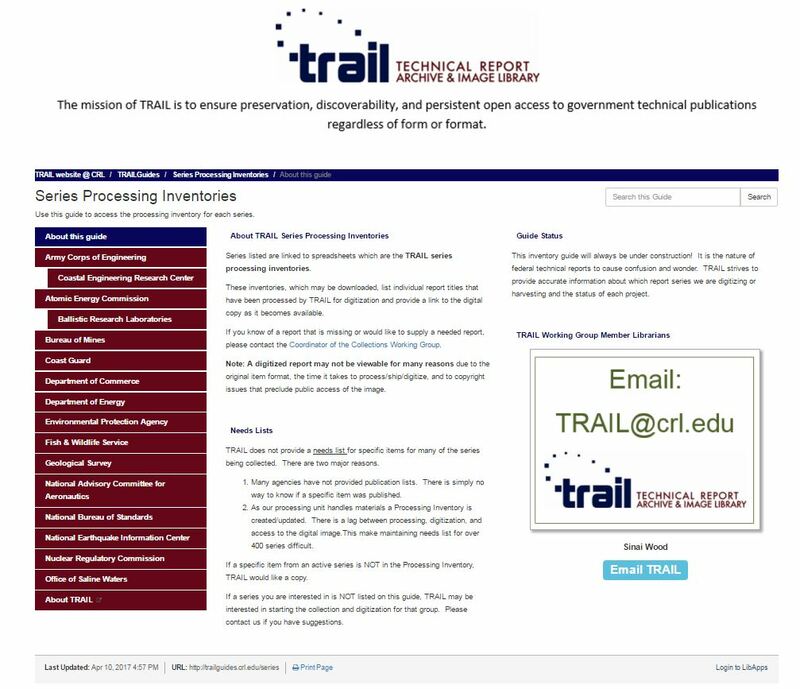 The TRAIL Search Interface is the free search engine for finding TRAIL digitized content: http://www.technicalreports.org/trail/search/. Please feel free to add this link to any guides, webpages, or instructional material where it would be useful. Series information can be found on our Series Processing Inventories Guide. This guide also lists information on the reports we need in order to complete our work on various series.